Heritage for Peace are seeking an English and Arabic speaking volunteer to join the newsletter team. Time commitment is roughly 2 hours a week. Please let us know, with CV, at the email at the end of the newsletter if you are interested. According to the Director General for Antiquities and Museums, 250 archaeological buildings in the Old City of Aleppo have been documented “as part of the integrated plans for the rehabilitation of the city…and the restoration of damage caused by the activities of the terrorist organizations. …about 40% of the city’s ruins suffer minor damage and are in good condition, 30% sustained medium damage, while the rest were severely damaged.”Read more on the SANA website here. The DGAM have also published photos of the damage to some more of the historic buildings in Aleppo here. Aleppo Archaeology are appealing for helping in saving a rare historic room from one of Aleppo’s historic houses here. 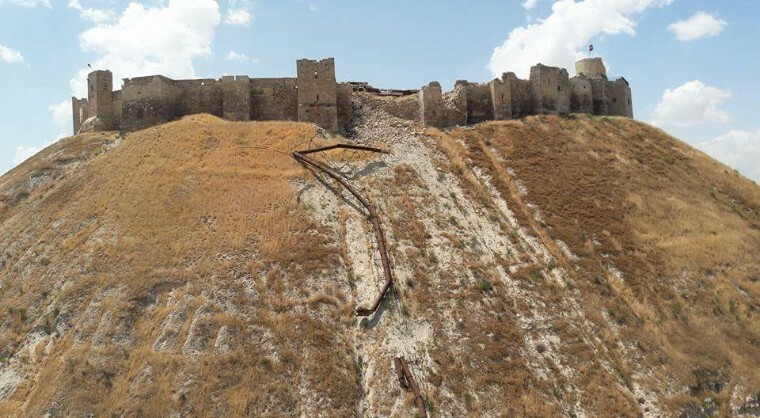 They have also published a photo of the damage that occurred last year to the Wall of Citadel here. They have published damage to Rumi Mosque here. The Association for the Protection of Syrian Archaeology have published details of damage to the Grand Mosque of Al-Bab, Aleppo here. A photo appears to show damage from water arriving at the al-Samra mosque in Raqqa. See the Facebook post here. Idlib Antiquities Centre have published 2 photos of damage to an unnamed Dead City here. The Authority of Tourism and Protection of Antiquities has documented sites in the Middle Euphrates Valley here, with additional information on sites in the Middle Euphrates Valley and the Balikh Valley here. Tell Ahmer – Tell Afandi – Tell Farfara – Tell Meshrak – Tell Sawadik are documented here. Sites around Derbasia are documented here. Tell Al Hanawia- Tell Al Tabqa – Ger Zyarat-Gere Rash are documented here. In order to protecting the archaeological sites the Authority Of Tourism and Protection Of Antiquities in cooperation with the municipality of Sere Kanye ( Ras Al Ain ) prevented burial in Tell Halaf site, where another place has been dedicated for burial. See here. Read the full Market of Mass Destruction article here. The Kurdish security forces in Al Jazira Canton (Al Asayish) arrested some promoters and trafficker of antiquities with a collection of pieces. These confiscated pieces included (a piece representing the mask of Tutankhamun, a leather piece with images, a statue of a man). Details here. Photos have been published here of the cleaning and restoration ongoing at Bosra Citadel here. The Authority of Tourism and Protection of Antiquities in Al-Jazeera Canton is hosting an open workshop from Friday 12 / 5 / 2017 and until 16 / 5 / 2017 on history with field trips to 6 sites in the province. See details here. The Authority of Tourism and Protection of Antiquities in Al Jazeera Canton cooperated with self-management in Kobani canton to extract a panel mosaic as part of a rescue campaign from the site of Tell Shiukh Tahtani with a group of specialists and mosaic experts from (ICCM) and transferred it to a safe place. See further details here. “Eighty-nine looted artifacts have returned to Syria through Lebanon and the sale of other looted artifacts in Europe has been stopped in cooperation with INTERPOL and UNESCO.” The archaeological artifacts are on display in Treasures of Syrian Heritage, a new exhibition at the National Museum of Damascus. Read more on the the Directorate-General of Antiquities & Museums (DGAM) website here (Arabic) and here (English), and on the Syria Times website here. Additional photos are available here, published by Students of Archaeology & Museums at University of Damascus. The grant call: Research and Training on Illicit Markets for Iraqi and Syrian Art and Antiquities closes 26 May. See here for more information. With the support of the Museum of Mediterranean and Near Eastern Antiquities in Stockholm, a Russian photographer salvages Syrian photos from 1950 – 1980. Read more on the the L’oeil de la Photographie website here. A new deal signed by Russia, Iran, and Turkey went into effect on May 6, creating four de-escalation zones in Syria. Read more on the Al-Jazeera website here and New York Times here. An interesting article (with some very good links) on the ICC and the role of non-state actors in the destruction – and protection – of cultural heritage can be found here. WPR asks “Can ‘Blue Helmets of Culture’ Save the World’s Imperiled Heritage?” The answer – probably not. Read the full article here. Fighting for Ethics in the Global Antiquities Market – an opinion piece discusses how to combat the sale of illicit antiquities. Read the full piece on the WBUR-FM website here. Statues in Zeugma share style with Palmyra – Read more on the Hurriyet Daily News website here.